- The concept of Neelix having a romantic relationship with a Talaxian female, following his long-term romance with Kes, was thought up by Neelix actor Ethan Phillips as early as the beginning of Star Trek: Voyager's fourth season. At that time, Phillips said, "I think it would be nice if they came up with another relationship for Neelix. It would be a very sweet show. I don't see anything coming down the pipeline yet, but the possibility exists… Maybe there will be some female hedgehogs waiting around for him! We'll see." - Ethan Phillips cited this episode among five "Best of Neelix" installments, remarking, "It was the best goodbye anybody had […] It was one of my favorite things on the show to have done. The episode also had that very sweet moment with Tuvok dancing just a bit for Neelix. It was very special." - Many people took part, on-camera, in Neelix' farewell scene. "Everybody was put into Star Trek uniforms and they lined the halls," remembered Ethan Phillips. "So I was saying goodbye to not only the cast, but to the crew, the extras, to everybody as I walked down that long hall." Jeri Ryan admitted that the filming of the scene turned out to be her most emotional day on Star Trek: Voyager, even though it wasn't personally her final day of working on the show. "I was just blubbering… That was a tough day," she reflected. - Neelix' farewell is similar to Worf's departure from the USS Enterprise-D in TNG: "Redemption". "This is an official ship function, Commander. Don't make me order you to dance." "Mr. Neelix. (Wiggles one foot) Live long and prosper." "I'm not a fighter, I'm just a cook." Ethan Phillips is correct above: it is one of the best Trek goodbyes, and probably the best on the show, certainly better than the one that Kes got. (Not that I'm still bitter about that or anything.) It's also reflective of how much better the character's arc has become over seven seasons, in particular since he and Kes broke up. There was even a call-back to "Jetrel" WRT the Talaxian colonists wanting to escape Haakonian rule that helped redeem that episode a bit (as did "Mortal Coil"). If the episode sometimes seems like it's overselling Neelix a leetle bit--like, not even mentioning that he still spends a lot of time in the galley--it also makes the point that he's also gone beyond "itinerant junk trader" quite a bit over the years; it may not be an especially dramatic character arc (well, except for that one time that he died), but it's there, which is not the same that you could say for all the crew. (Looks in Harry's direction, shrugs, sighs.) I'm not sure that I necessarily bought that they could have had a functioning ecosystem in that asteroid (although not the first time that Trek has shown such a habitat; my first choice for the above-the-cut text was "For the World is Hollow and I Have Touched a Widow", but thought better of it), and 500 people seems like a pretty restricted gene pool, but those are minor quibbles. Ethan Phillips does a great job with his coming around to believing that maybe he is the guy of the hour, for once. I also liked the actress playing Dexa and how she gradually warmed up to Neelix. The scene with Naomi was pretty poignant; she's obviously still a little girl, but she's at the age where she's not as far as she's concerned. It reminded me, of all the things, of "Puff the Magic Dragon", which, if you're not absolutely convinced that it's all about the drugs, maaaaaaaaaaan, is really one of the saddest children's songs ever. And the last Tuvok/Neelix scene demonstrates, once again, how exquisitely dry Tim Russ' depiction of his character's sense of humor can be. Poster's Log, supplemental: One regular episode and a wake-up call left. Particle of the Week: I was distracted enough not to note one, which means they did a good job. Pointless STO Comparison of the Week: When you meet Neelix in Star Trek Online, he's still with Dexa on the asteroid, but they're being attacked by the Kazon for... some reason. Brax is nowhere to be seen, but it is about 25-30 years later, and he has presumably grown up and found something to do. * Maximum Possible Photon Torpedoes: -29. * Crew: 135. Down Neelix, of course. * Credulity Straining Alpha Quadrant Contacts: Still just 16, but I want to talk about this below. * Another Credulity Straining Delta Quadrant Contact. At this point, they're actually closer to Earth than to where they met Neelix - it's only about 30K LY from home, putting them ~40K LY from Ocampa, and the journey would take someone using conventional warp drive decades. Meeting Talaxians out here was pretty weird. To be clear: I didn't mind this, I just wished someone on the show had asked them about their shortcut, or at least commented on how odd this was. Like, 'hay guyz where's the wormhole/transwarp/Underspace/whatever that you used to get this far?' or the like. One minute on the topic would've been sufficient. * This is pretty good overall. Yeah, I'm pretty much with you about the content: Neelix is oversold a bit, but it's still a pretty great goodbye, and I'm still annoyed Kes got nothing. Heh. I even liked Tuvok offering a single foot waggle, even though Vulcans should be allowed their dignity. * Thinking about the upcoming ending. This was the first time I actually saw this episode, which got me thinking about another thing: people generally remember a show the way they left it, and I think this is part of why Neelix can be a divisive figure in fandom. Anyway, decent story, good sendoff. They had about 22 years to get from Talax to the asteroid, avoiding Borg, Hirogen, and Kazon. A monumental feat, yet they can't figure out how to deal with some provincial miners. Yeah, there's a thing I've noticed in rewatching shows I watched originally in first run where the absence of the marketing hype or the rapidity with which cliffhangers are resolved has changed my perspective of shows. I didn't like either VOY or ENT on first run to the point where I dropped out entirely - VOY was too Neelix-y/Paris-y for my taste, ENT was a little too gotdang post-9/11 for my taste. But rewatching an episode a night, some of that bad taste is washed away quickly enough that it doesn't have a chance to build up. By the end of the rewatch, Neelix had gone from the irritating buddy alien to a solid member of the crew. I'm just saying, every show should have 7 seasons produced before they release anything, preferably all at once. Do we know why Neelix left the show so close to the finish line? Was Ethan Phillips off trying to land his next project and needed to leave early? Did the writers not want Neelix to go to the Alpha Quadrant? Fair question, Servo. Here's what some casual digging turned up! 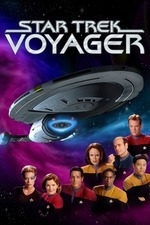 "That was a big decision," the former Voyager executive producer told Anna L. Kaplan at Cinescape. "We often said, 'What would happen if Neelix ran into Talaxians and had to make a decision?' I said very early on in the season, the only way I would do that story was if Neelix left. The audience's expectation would be that he's going to struggle with this decision and then decide that Voyager is really his home and his family, and he is going to stay with Voyager. That was a cliched story to tell, if that were the outcome." By the end of the rewatch, Neelix had gone from the irritating buddy alien to a solid member of the crew. This matches my feelings about the character, and helps make this a nice solid episode in my estimation. I'm slightly bothered by how his Big Corridor Send-Off is so identical to Worf's in that one TNG episode, but less so now than I was the first time I saw it. Probably because I've never been as attentive to VOY as I was on this rewatch. Was Ethan Phillips off trying to land his next project and needed to leave early? Did the writers not want Neelix to go to the Alpha Quadrant? This episode isn't Neelix's last appearance on the show, so I'm guessing the latter is more likely than the former. I sort of always assumed it was the latter. Hot take: they should have just kept Tuvix. All respect to Tim Russ. They should have taken Tuvix and ran with it, combining the entire crew down to one perfect individual. And the Doctor. Ah yes, The Adventures of B'kimotayway Tomuvix and The Perpetually Horrified Doctor. ... okay, might have some tired jollies going on. Yeesh. Now I'm imagining something like a huge shoggoth, rolling through the corridor with combadges and Borg implants and swatches of gold, red, and blue-green fabric sticking out of it at random, covered in eyes and orifices of varying levels of identifiability. It rolls into sickbay, groaning and farting and, well, doing other things with its various holes; the Doctor doesn't even look at it, just grabs a random hypospray and jabs it with it. It rolls away and the Doctor puts on Einstein on the Beach at ear-splitting volume and cries. I suddenly wish I had the time to figure out how to do this on STO's Foundry (for player-created missions). Alas, probably too steep a learning curve to just hop right in. SAW GERRERRA: B'kimotayway Tomuvix will know… if you are lying!! I ran the distance numbers. Using mordox' 40,000 light year estimate, it would take 187 years to reach this asteroid at Warp 5. Even at Warp 9 it would still take 26 years, and the destruction of Rinax was 22 years ago. They would definitely need to hand wave this with a worm hole or warp conduit. I vote Q too, it's one of my favorite hand waves. Pretty much has to be divine intervention, as the shortest possible path cut directly through the heart of Borg space. I vote for Suspiria. One of the things that still bugs me about the series is that they left that plot thread dangling. Sorry I wasn't able to keep up with the rewatches, but life got in the way. I've been reading the posts though and y'all have continued to do a great job with the analysis. Sure, there are some things I disagreed with on occasion, no surprise there, but maybe someday I'll get the chance to catch up and annoy you all again with my hot takes. Heh. Anyway, the conversation about the improbability of meeting another group of Talaxians so far from their home just reminded me of how irked I was that it had to be a Talaxian for Neelix to leave the ship. As if just a similarity between Talaxian history and that of another species wouldn't have been enough. For me, it just points to the narrowness of the shows vision of connection and why they kept screwing up on race so often. They couldn't imagine Neelix leaving the crew for anyone but someone of his own race is how the episode felt to me, so they had to ignore the improbability of events that would make the encounter remotely reasonable to put a Talaxian there for Neelix. That emphasis on sticking to one's own kind, or, in the Trek family way, the core races of the show, informs way to much about how they deal with many of their encounters. The crew might find temporary romantic interest in some "alien" encounter, but in the end you stick with your own. That's the expectation they set up over and over again, where the "sacrifice" is always leaving those others behind in favor of "your own kind". An idea one would hope would fade in an era of interstellar travel and shared histories across many races/species. They never really managed to fully envision a truly shared universe, where beings could find common values and interests and develop relationships as equals. In the end, its about humans and Earth, which carries an ugly reflection of how narrow the view so often is in the world today. Our kind first, others maybe later, with the likeness of "our kind" all to often being construed in the narrowest of ways. Neelix did improve enormously over the shows run and this episode, from memory, was a good cap for the character. I just wish the doctor hadn't declined as much as Neelix improved, by my estimation, but that's something for another time perhaps. Keep up the good work and I'll be looking forward to reading your take downs of the finale. I doubtless would have raised some disagreement since I'm with team "Screw the timeline" Janeway 4eva, but since I won't get to rewatch it anytime soon, you'll be safe from hearing me ramble on about it. They couldn't imagine Neelix leaving the crew for anyone but someone of his own race is how the episode felt to me, so they had to ignore the improbability of events that would make the encounter remotely reasonable to put a Talaxian there for Neelix. That emphasis on sticking to one's own kind, or, in the Trek family way, the core races of the show, informs way to much about how they deal with many of their encounters. Nice to see you all too! I've really missed being able to join in on the discussions. It's easily been one of my favorite things I've been a part of on the site, but work and a move have taken too much of my free time to watch much of anything for months. I figured I'd take Neelix as my guide and use his goodbye episode to say how much I enjoyed the rewatch threads they've been equal parts fun and enlightening.